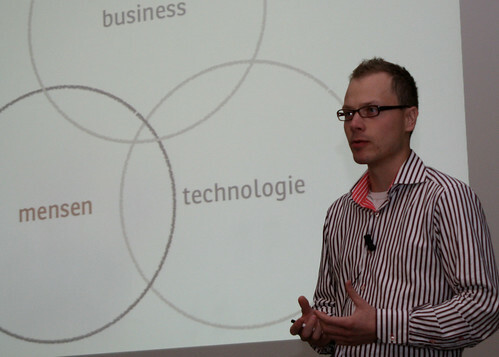 I was invited to present at the 2nd Meet & Create (dutch) session. This session was dedicated to service innovation and especially the uprising of service design. Because this was a very creative crowd I took the opportunity to focus very much at the here and now of service design. This resulted in a presentation titled “the life of a service designer”. Trying to give the audience an overview of what they would experience if they’d join our studio for a week. To answer this I just simply looked at what it is that we actually do at 31Volts… I ended up with a short list where I accompanied each item with a real-life project and some tangible deliverable. It was very refreshing to do a very practical presentation for once. Usually service design presentations tend to be pretty strategic and discuss things on a meta-level. I’d love to hear If you have some valuable additions to the list! mmnn… interesting, good to see what designers says what they do! is balancing different stakeholder requirements part of your daily life (a bit like a design manager)? who handle the job of the diffusion of whatever type of solution your create as an external consultant? Could you elaborate a bit more on your 2nd question?